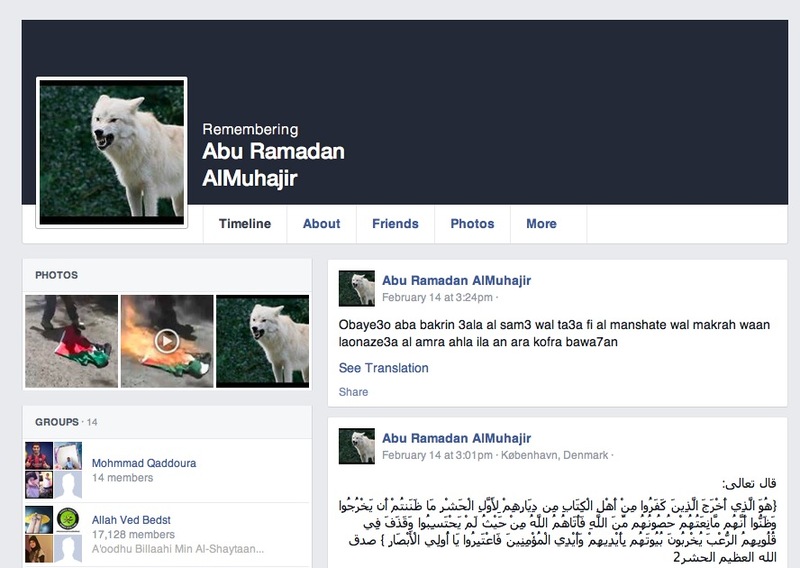 On Monday morning, we discovered the Facebook account of Copenhagen shooter Omar Abdel Hamid El-Hussein. Since it was taken offline a few hours later, we summarize its content here for people wanting to research the background of the man. • The URL of the page was http://www.facebook.com/omar.gz.374, an apparent reference to the real first name of El-Hussein. But at the moment we found it, the account bore the name ‘Abu Ramadan AlMuhajir’ — preceded by epithet “Remembering”, as if the owner had prepared his death. Further personal details, such as date of birth or place of residence, weren’t mentioned and it also wasn’t clear at what time the page was established. That it indeed was the Facebook account of the deceased terrorist, was later confirmed by one of his friends to a Danish news site. • The account did not contain any picture of El-Hussein and his friends list wasn’t public. But the ‘likes’ that could be seen, consisted mainly of people belonging to the Copenhagen Muay Thai Club of which El-Hussein has been a member, and to the Palestinian refugee communities in Jordania (especially in the town of Irbid, it seems) and Lebanon (especially in Saïda, where El-Hussein’s family is told to have its roots). We didn’t see a direct proof of links to other people with an extremist or terrorist background — but that’s up to further research. • The oldest message was posted on September 28, 2013. 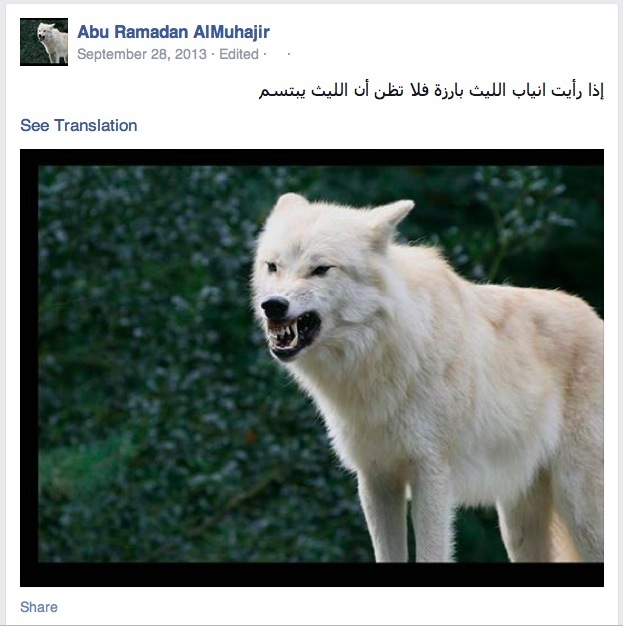 It showed a picture of a white wolf with a comment in Arabic stating “When you see the teeth of a lion (sic), don’t think it is laughing.” 15 people liked the post. • The next message was posted on February 14, 2015 at 2:39 pm, Danish time apparently. It contained two screenshots from a video, showing someone who is burning and trampling a Palestinian flag. 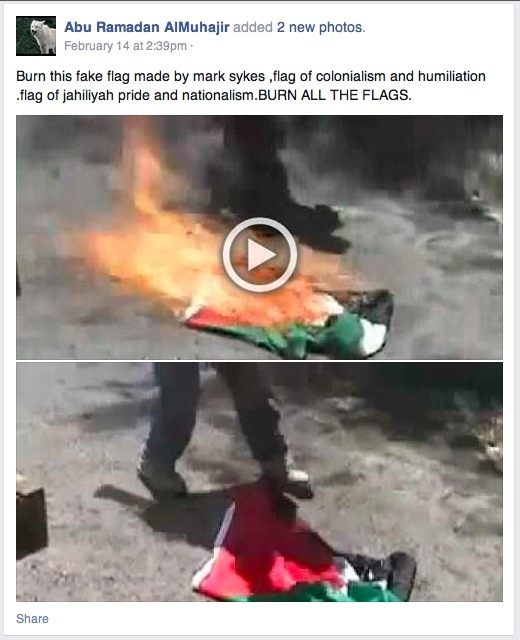 The comment in English was: “Burn this fake flag made by Mark Sykes, flag of colonialism and humiliation. Flag of jahiliyah pride and nationalism. BURN ALL THE FLAGS.” We saw no likes for this post. • On that same February 14, 2015 at 2:57 pm a link to YouTube was posted. 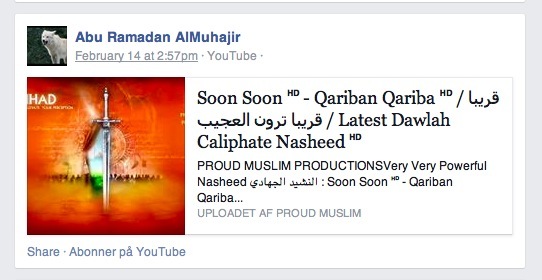 It consisted of a video uploaded on the account of ‘Proud Muslim Productions’, titled ‘Soon Soon – Qariban Qariba – قريبا قريبا ترون العجيب – Latest Dawlah Caliphate Nasheed’. A copy saved for research purpose can be found here. Apparently, it is the same nasheed that could be heard in the recent video message of Islamic State, titled ‘Healing the Believer’s Chests’ and showing the execution of the Jordanian pilot who was burned alive in a cage. The translation of the text appears to be “Soon, soon, you will see the wondrous sight, a fierce conflict. And you will see, there will be battles in the heart of your abode. To destroy you, my sword has been sharpened. We have marched by night to cut and slaughter.” No likes for this post. • On February 14, 2015 at 3:01 pm a post explicitly mentioning its location as ‘København – Denmark’ consisted of a text in Arabic. Apparently it was verse 2 of Sura Al-Hashr — the story about the expulsion of a Jewish tribe as told in the Quran. It can be translated as: “It is He who expelled the ones who disbelieved among the People of the Scripture from their homes at the first gathering. You did not think they would leave, and they thought that their fortresses would protect them from Allah; but [the decree of] Allah came upon them from where they had not expected, and He cast terror into their hearts [so] they destroyed their houses by their [own] hands and the hands of the believers. So take warning, O people of vision.” No likes for this post. • On February 14, 2015 at 3:24 pm, a text was posted in Romanised written Arabic, being a pledge of allegiance to Abu Bakr al-Baghdadi, the highest leader of the terrorist group Islamic State. It can be translated as follows — thanks to Pieter Van Ostaeyen for his help: “We pledged to Abu Bakr to listen and obey in our ease and our hardship, in what we find pleasing and what we dislike. We do not dispute the authority of those who possess it, except if we see open disbelief upon which we have clear proof from Allah”. Again, no likes for this post.